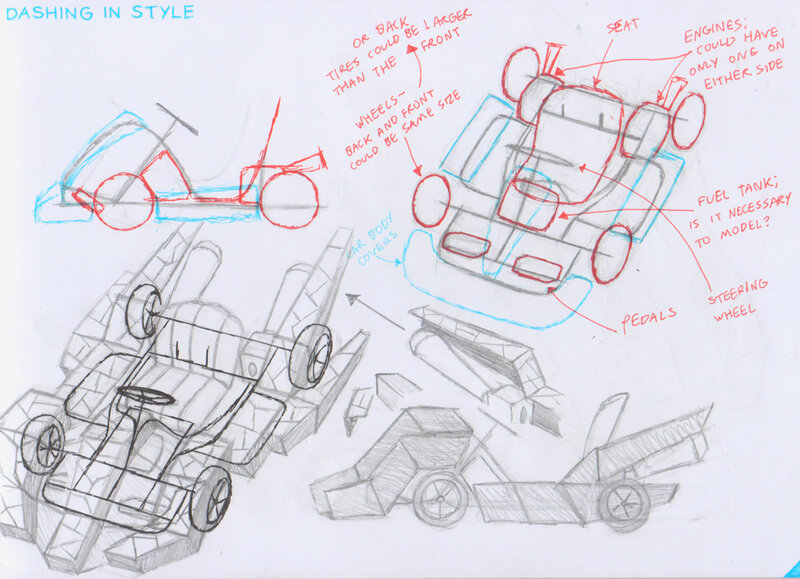 Designing a glass kart seemed simple enough. I quickly got inspiration from church stained glass windows for the influence to its design. 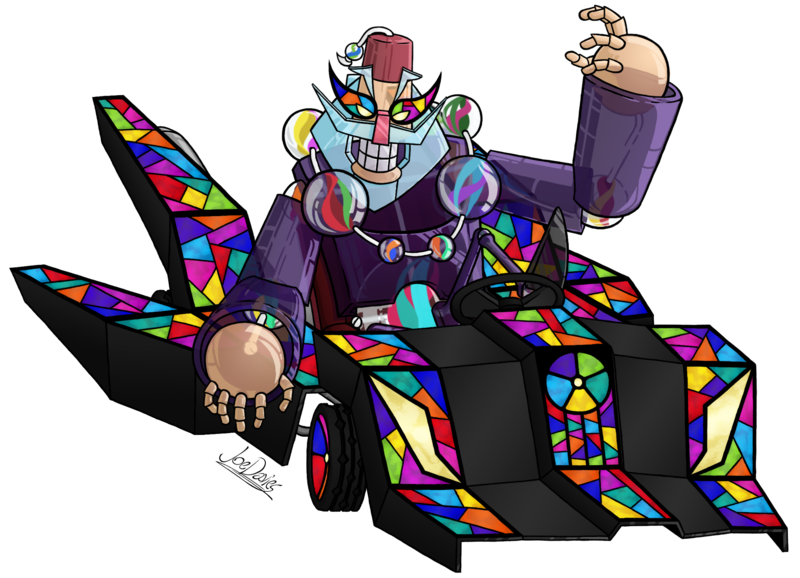 And I wanted black to be the main colour of it, for it was the kart of an evil villain, and black is a fitting colour for such a character. 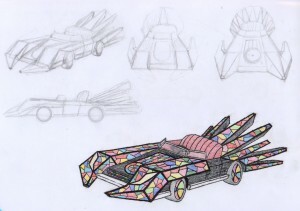 But as this was the first kart I’ve ever designed, the Games Design tutor recommended I do some research and jazz before approaching its design. 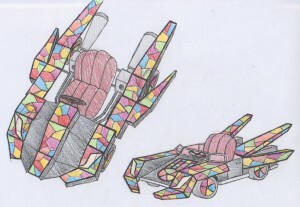 I even had a design that I was pretty proud of, but they turned it down because it didn’t “look” realistic. Or in that it doesn’t look like it could “feel” realistic. So I had to spend a bit of time running back and forth, doing various bits of research into car design before doing this one. In the end, they said that they would prefer I make the standard kart frame, and then put the glass coating on top of it. And do that for the other two karts, but with each of their respective material. To make matters worse, there were apparently limits I had to keep in mind when designing it. Limits that I didn’t quite understand, but can only assume it is due to the inexperience of my team (and I’m not trying to be condescending, we were all learning students at that time). One bizarre limit, was that I could not use sharp pointy ends in its design. Because apparently, the Unreal Engine 4 does not support making pyramid-like shapes, unless the designers are willing to take cube shapes and cover the index points together to make a pyramid shape. But that is apparently very taxing for the designers. That I can understand, but it presented a problem for this design as the sharpness of it was key to representing the kart of an evil villain. In the end, I had to shave off the pointy bits into stubs, which was good enough. This kart design was an amalgamation of inexperience in vehicle design and limiting options that made certain parts of it less impressive than they should have been. And that is why it’s my last favourite design out of the three. I’m really not a fan of the way it looks. But, out of all three of them, this was the only kart to be modelled in the game. I guess at the end of the say I learned what it means to have a cool design that has to be stripped down into something less impressive due to certain constraints. And it has to happen sometimes. It still doesn’t mean I like this kart though.